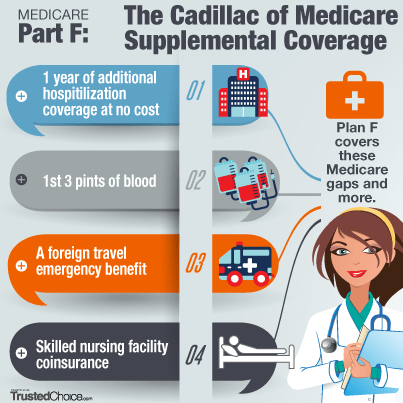 Considered the “Cadillac of Medicare supplemental coverage,” this Medigap plan picks up where other Medicare plans leave off. It still has its own limitations, and it is important to gain an understanding of your options to select the right policy for your needs. Medicare Plan F covers many different things, and as long as Medicare approves the charge, you will typically have no out-of-pocket cost at all, according to our partners at Trusted Choice. A foreign travel emergency benefit (after a $250 deductible) up to $50,000, which is a great addition to your plan if you’re an active traveler in your golden years. A $250 deductible for foreign travel emergency costs, paid annually. Choosing a health insurance policy involves comparing costs and benefits, and finding the right balance for you. Take time to research your options and get advice from our well-qualified professionals at Neely Taylor Wade Insurance .